What’s in your Pan de Sal? But this closeness to bread is in the blood. My grandmother, besides being part of the first class of graduating doctors that included females in the 1920â€™s, also owned a bakery in the 1950â€™s that apparently had the most terrific brick ovens and dedicated bakers. I donâ€™t remember the bakery at all but my two oldest siblings have great memories of it. In fact, my sister learned how to bake there. How could you not become an expert when your grandmother set before you the best classroom, teachers and unlimited materialsâ€¦ didnâ€™t get that ensaimada quite right? Do it again and again and again. Until perfect, thanks. At any rate, there is history in this fixation on pan de sal. Having said that, I could almost write a rant on how bad the pan de sal has gotten in Manila in recent years. There are few if any commercial pan de sals that come anywhere close to the pan de sals of the 50â€™s and 60â€™s. Many variations today are too small, too sweet (it’s a salty bread! ), too airy, possess no crust, have a strange shape, etc. etc. I am not sure if it the quality of flour, bad yeast, added sugar, lazy bakers, whateverâ€¦but this is a national treasure that has been allowed to deteriorate. In France, there are standards around their baguette, here we have price controls that result in size diminution. Several years ago on the way to the Dimasalang Wholesale Flower Market, I used to pass one of the first outlets of Pan de Manila which baked pan de sal in wood fired ovens. It wasnâ€™t the best but it was good enough particularly when you chanced upon them coming right out of the oven. Dozens of branches of this bakery have since sprung up around Metro Manila and I am almost certain that the quality has deteriorated. It is still pretty good for the first 15-30 minutes it emerges from the oven but it tastes dreadful several hours later. It doesnâ€™t have the typical shape of a pan de sal and itâ€™s airier than it should be. It doesnt re-heat well at all. But itâ€™s better than making it myselfâ€¦ So the question of the day for all you folks out there is this: what is your all time favorite palaman (filling) for your pan de sal??? General, Other Food Products, Kitchen Equipment, Etc. No one makes a proper pan de sal anymore. Closest thing is a small baguette from a French bakery. My favorite palaman is of course leftover adobo. A good pan de sal has a hard crust, tender airy crumb and has only 4 ingredients: yeast, water, hard wheat flour and sea salt. It must have that distinctive crack down the middle. Lola’s brick ovens were fashioned by Italian bricklayers, retired US Army men who remained in the Phil after WWII. The two ovens were the supersized version of your wood fired pizza oven, fueled by red mahogany for serious heat. Not environmentally correct but effective. Pan de Sal was shaped with a wooden scraper and placed into the oven on long paddles, slipped off onto the hot brick floor. Always the first bread baked on every shift. We were allowed to stay up long enough to have a few from the evening shift with soft boiled eggs, eaten under the mosquito nets. Unless you have an oven that can achieve 600-700F and a bakestone I wouldn’t even bother trying to make pan de sal at home. I would give anything to have Lola’s pan de sal again. So marketman, what about ensaimada? That you can make at home with excellent results. My all-time favorite palaman would have to be corned beef. I have fond childhood memories of pan de sal with corned beef which I would make baon to school. A close second would be pan de sal with melted cheese whiz. As for fillings: nothing beats a small pat of butter teamed with a generous smear of liver spread (Reno liver spread for commons; pate de foie d’oie on special occasions. But western-style peanut butter on hot pan de sal is a cure all whenever I’m, down in the dumps. yeah! very true and very effective strategy. Like your dear sister, my favorite palaman is leftover adobo, torn into pieces and heated again until it dries!MMMMM, sarap talaga with a dab of butter or kesong puti! As a grade schooler, one of my chores is to wake up early and buy our pan de sal 2 kms. away from home! The walking was my exercise and I usually ate half of the batch of hot pan de sal on the way home, it sure was a great chore!!! Yeah, “pan de sal” today is too soft, too airy and too sweet. I miss the pan de sal of my youth with its crisp crust and soft center. When we were kids we would poke a hole in one end and dribble condensed milk in the center. I say dribble because condensed milk then was so viscuous that it took forever to flow out of the can. My all time favorite palaman is butter, specially on hot pan de sal straight from the panaderia. Corned beef comes a clos second. We also used to have pan de sal with butter and a sprinkling of sugar. pan de sal with peanut butter is tops!!! kamuning area. the pans were big and crusty. lastly, nothing beats a wood burning oven for pandesal. every crumb is gone by 9 or 10. I was gifted with a box-full and it kept very well in the freezer, still good after reheating. Havent had it recently, though, as part of my on-going SBD efforts, but cheat with lesser quality carbs, haha! And of course, callos, especially the malagkit version (with all the ‘litid’, yumyumyum). back in the day, nothing was more satisfying than a good pan de sal with what we matial law babies would then consider luxuries: ligo sardines fried in onions, hereford or libby’s argentinian corned beer, spam (with mayonnaise), peter pan peanut butter… washed down with a small bottle of 7-up you have to share with your sibling. still, i believe the best palaman for a good pan de sal would be ube or queso flavored ice cream from your neighborhood sorbetero. My favorite palaman would have to be butter, straight up on a hot pan de sal. Heaven. Close second would be kesong puti, with both pan de sal and kesong puti toasted together on a skillet. Mmmmm…. Can a nominate a third? Condensada! my favourite pan de sal palaman is matamis na bao. 2 cents’ worth here. pan de sal is my all time fave! btw, your site rocks! cheers from australia. I love pan de sal with butter and sugar on top. I also love pan de sal by itself, without anything but the warmth of the chewy bread filling your mouth. Mmmm… pan de sal! My stomach grumbles as I think about it. What passes for pan de sal here in California is absolutely horrible compared to how I remember it. Anyway, my favorite palamans: corned beef (has to be the Philippine variety… Purefoods… long strands of red, salty meat), or cheddar cheese, or just butter. i love pandesal with no palaman at all. i still remember my treks from the local pandesal bakery in BF Homes (near the theater) when i was sent out for the chore. 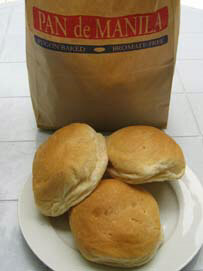 i’d buy a bag of steaming hot pandesal and munch on them all the way back home. even today my kids eat fresh-baked pandesal without any filling. BUT i did enjoy it with Dari Creme, back in the day. i loved cheez whiz but the flavor was so fleeting, so sliced Kraft cheese (and now here, Cabot) is best. what i no longer do is down the hot pandesal with ice cold gulps of Pepsi. BTW, awesome post from your sis re the brick ovens! there’s an ever-growing movement in the US to bring this back — perhaps you could start the movement there. people are now building brick ovens in their yards (for as low as $200, to up there in the thousands) so they could have hearth-baked artisanal bread. it’s my ultimate “one day” dream. I love my freshly baked hot pandesal with liver spread. One of my fav childhood memories was buying a bag of it at the corner sari-sari store very early in the morning and then toasting them on hot coals in a drum refitted as ‘ihawan’. hot pan de sal’s great with butter or menudo! mmmm…! No palaman for me. As long as the pandesal is hot, that already rocks as far as I’m concerned. I just dip ’em in some really really good coffee..pwede nako mamatay. Chris! hwag naman! although pan de sal at kape nga ang pinapakain sa wakes, along with dunkin’ Fita cookies hahahahaha! My biggest regret these days is that it costs a lot for more for a lot less pan de sal! Like eating air! Here is the pandesal recipe we have using the breadmaker to mix the dough. Wala kasing pandesal dito sa Wellington. Hindi na kayang lumamig when we have a party, dahil ubos agad, kaya dapat mabilis ka :). Makes around 36 pcs of pandesal. Put them one by one in the above order. Don’t mix. Set breadmaker to 8=Dough. The timer will automatically set to 1.5 hours. Set to 180 degrees. Bake for 15 minutes. I haven’t had PROPER pan de sa in the LONGEST time!!! Wow, marketman, everybody loves pan de sal! Long thread here! How about this for palaman? Victorias (of Victorias Milling Co. of Negros Occidental) brand of Hot Sardines in oil(Spanish style), put mayonnaise and capers. When I was in grade school, I would trade my pandesal with chorizo or spam with a classmate’s pandesal with guava jelly and cheese or hardboiled eggs mashed in mayo and pickle relish. Yumyum! Kesong puti for me or just with plain ol’ butter! Danish butter, or dunked in Batangas hot chocolate! Cold unsalted butter with condensed milk on hot pan de sal. Yum! This is a fairly recent discovery of mine, hehe. Tastes and feels like a wickedly rich ice cream sandwich. First off, I enjoy your blog very much. Keep it up! Could you please post a picture and blog about Putong Puti next time? Thanks. There is almost enough material for a paperback book on pan de sal and it’s various fillings! Hmmmm… Glad you all feel so strongly about what to put in your bread! Kelia, will try to get to puto at some point! great great site marketman! I love the pandesal from Le Couer de France ! Pan de Sal and leftover Adobo is it! Does anyone have a recipe for old fashioned pan de sal? Thanks. the best talaga ang pandesal ng mga pinoy!great! I think pan de sal goes best with butter or cheese because of its slightly salty content. But there is a tendency for the bread to be made with more sugar these days. I’ve just come across the marketman blog (courtesy of my sister) and am happy to know that there are others out there who are as into food–pinoy/asian/european– as i am. When I was a kid, I used to have pan de sal with condensed milk. Sometimes I topped the condensed milk with a thin layer of sugar to get some crunch and extra sweetness. I don’t know if anyone else did it, but to quickly get the milk out of an almost empty can, I blew air through one of the holes while pouring the milk. My next favorite is star margarine, of course topped with sugar. Mmm-mm-mm-mmmmm!!! Man oh mighty do I miss pan de sal. That stuff totally rocks! American raised, I was born in the motherland, but visited only twice in my lifetime. Last time I visited, I’d wake up every morning to the sound of the boy’s ringing of his bicycle-bell and his voice “Pan de sal! Pan de sal!…” The first few days of my stay, my relatives thought I was crazy when I’d run out in the middle of the street with money on hand yelling, “Hoy! Over here!” . During the remaining weeks of my vacation, the little boy would simply leave the FRESH, WARM bags of pan de sal on our doorstep, knock on the door and ride away as fast as he could away from the crazy lady’s relative’s house. I later found out that my Auntie paid the boy in advance to cover the rest of his pan de sal morning deliveries for the remaining weeks of my vacation. I’d alway eat the first bread with NOTHING, then I’d devour the rest with ANYTHING I’d find in the kitchen: coffee, hot cocoa, tea, butter, pork adobo, leftover pinakbet (I’d dunk it in the soup), caldereta. Hey, Ed, condensed milk was my brother’s ultimate favorite. And I like that, too! The thing is there is no truly one authentic, one original pan de sal recipe that the Filipinos can call “the one”. Recipes are as varied as the Filipinos are. It is a reflection of our distinctly-fragmented culture (i.e. tagalogs, warays, ilocanos, etc. )as opposed to the one single culture of the french, or the japanese, or the brits or what have you. Hence, dozens of pan de sal variations exists and will continue to exist. What recipe is the best? It’s hard to tell unless one has tasted them all. Most importantly, how we perceive pan de sal is more tied to our childhood memories rather than its objective taste. Don, I do agree with you that there must be several versions, but I think a lot of the nostalgic take on it is that the current versions have become far more soft (no crust), sweeter and less a shad of their cousins just 30 years ago. As with ensaimada (I have some strong views on this elsewhere on the site), it has evolved, but I think in general for the worse… One of my theories is that as income levels have dropped and the need to eat more economically presses the average consumer, then compromises in ingredients, technique etc. have essentially brought the quality of many food items down… but that’s just my opinion. i haven’t had a proper pan de sal in a loooong time! it’s always too sweet. i want to make my own, what recipe should i follow? and how much sugar should there be if at all? If you want a recipe of pandesal try http://ragazzeinfarinate.blogspot.com/ it may not be “the original recipe” but worth trying for. Hindi tumitigas even after three days at walng takip. thank you marketman, for your recipe. im no baker, just an OFW longing for pandesal, so i needed to read between the lines and experiment. from one site, i learned to knead the dough, nice, it was illustrated. and from another i discovered using a pizza stone in my oven to get that distinctive crusty top and golden bottoms. and yet from another how to form the logs and that distinctive pandesal crack down the middle. your recipe is spot on for my taste. i now enjoy my favorite palaman, leftover adobo, with homemade pandesal, whenever i fancy. i must say that i have learned another skill, that i can take home back to the PI when i go on leave. more power. danny, so glad to hear that the recipe works for you! myra, pan de sal is supposed to get hard if made right…at least in my opinion…but everyone has their own versions and preferences… Victoria, I have a recipe in my archives somewhere, just keep looking! hi there! i just want to comment on marie’s posted message. she did made the right name for the bakery which was sta. teresita but she got confused with the location. the bakery is in lipa proper and i would know because its our family business… i gurantee you, our pan de sal is the best. we dont use oven to cook our pandesal. we still use pugon na ginagamitan ng kahoy para magluto!! well, its now called “ACR Bakery”.. if you happen to drop by lipa, be sure to buy some pan de sal from us(but make it a point to visit our bakery before 8 or 9). … i’ve been a pan de sal fanatic since i was a kid so i bet i know what’s the best palaman!! Dairy cream!! Best with a hot pandesal specially during the summer is sorbetes ice cream as palaman, while in the rainy season is hot choco to dip it in. Christmas season brings cheese as a palaman. As children we used to use milk powder with a little sugar as palaman. My fave is Reno liver spread! Others are sorbetes, butter, condensed milk, and corned beef. But as soon as I get the pandesal out of the oven, I grab one (kahit napapaso pa) and bite into it right away, without palaman! Palaman only gets into the pandesal as soon as I have partially satisfied my cravings. Kids favorite would be ice cream (cheese flavor) as palaman. For the adult, I think just the classical batangas coffee or tsokolate dip would be the best. Regarding the authentic 1950’s pandesal(salty, crusty exterior and strong resistant interior), you may try out Pan de Amerikana 1950’s pandesal bakery situated at White plains Quezon City beside Lola Idang’s Katipunan Avenue. If you happen to live near Marikina, the main branch is Ordonez st. near Marikina World of Butterflies. I really love pan de sal. We are thinking of franchising one of the most famous Pan De Sal bakeries like Pan De Manila. I hope you can assist me. if you are in the area of project 2 Quezon City, try Kawilihan Bakery’s pandesal they still cooked their pandesal in brick ovens and firewoods. You’ll find that they have that crust in their pandesals plus you can buy several take them home and reheat them. i love to put sweet ham (Excellente) as palaman. reminds me of Christmas mornings. i love pan de sal with sweet milk! Pan de sal is so simple yet so difficult to make. Many pan de sals these days are big with a hard thick crust …. which is just wrong to me. A good pan de sal isn’t very big, with a crust that is thin but crisp, and a tender slightly creamy center. I’m not really impressed with Pan de Manila’s pan de sal. Pno nman kya pg ngproduce ng coffee flavored pandesal..
Di na kailangan p ng mainit na kape..
i want pan de sal kapag may peanut butter beacuse it makes much more sweetier. ayoko ng pan de sal na ang palaman ay iba. pero i still want pan de sal kahit walng palaman. I think the all time favorate of all Pinoys is Dairy Creme. Why can you find 1/8, 1/4, 1/2 cuts of Dairy Creme in almost bakeries around the Philippines ? coz when you buy pandesal you buy dairy creme,………………….or reno, or star magarine or ligo , or eden or cheez whiz hmmmmm I’m hungry…. a baguette will do if your out of the country, trust me . I live in B.C. Canada, and for those who are in downtown vancouver, Try aling mary’s pandesal. To die for. Filipinos living in the states buy bulk and freeze them for stock. Even Canadians love’em. hopping online, i made my way here. Pandesal? I remember, scrambled eggs with oozing ketchup in between, or, just Dari Creme, before dipping in hot coffee! Sarrrap! pan de sal is truly a filipino favorite, no doubt. very handy too. put them in plastic, or in paper bag, or a kfc bucket and off to the beach you can go. very flexible too. any palaman will do. it can go with any pinoy palaman which everybody had mention and hindi rin pwede isnabin kung isasabay mo sa gourmet food festival. try this, hot pandesal with kesong puti plus tomato and basil leaf, super. The key is, you have to have a good kesong puti, not the salty one.Healthy and delicious, gourmet ang dating. The best! i smother freshly baked pandesal with condensed milk – the best! I remember getting pan de sal fresh out of the oven and hot at Dizon’s Bakery in Cavite City, along with enough cheddar cheese to make a good meal. Dizon used charcoal to fire their ovens, and the pan de sal had a smoky taste. Delicious. I was on the Shore Patrol at Sangley Point, and we always finished our night shift at Dizon’s, just after midnight. My wife used to make very good pan de sal but has gotten old and forgotten her recipe. While not as good as Dizon’s Bakery they were a close second. And that was in a gas oven at home. Does anyone in this forum have a recipe of their own that they use and can post here? everytime i go home to the philippines, the first food that i craved for is hot pan de sal. any palaman whether sweet or salty goes with it. so yummy! i wish i knew how to bake a good pandesal for my family. can anyone share her secret recipe? i’d like to know the email add of pan de manila, ok naman breads nila, kaya lang minsan di maganda experience ko. paiba iba ang consistency ng kanilang mga breads. minsan malambot masyado, minsan maliit, minsan malaki. minsan naman matigas na parang luma. dapat kung marami ang bakers nila sinusunod mabuti ang sukat ng mga ingredients. pan de manila mgt, hello!!! TOP 10 PINOY DISHES for Independence Day!!! Three “Filipino” Cookbooks to Look Out For!! !